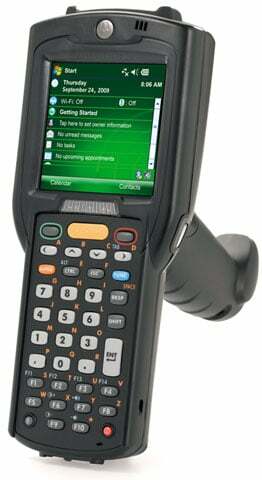 The rugged wireless Motorola MC3190-G is at home in the retail store and warehouse aisles, on the loading dock and out in the yard. The MC3190-G offers a comfortable gun grip, advanced computing power, industry-leading data capture capabilities and wireless communications. In addition to the processing power and memory required to support advanced applications, the MC3190-G also offers the latest in mobile technology and security. An integrated RFID tag automates asset tracking, allowing enterprises to track and locate MC3190-G devices right out the box. An integrated accelerometer enables leading edge motion-based applications that improve power management and more. Robust security features protect sensitive data. The result is a robust affordable device that will help retailers, government agencies and distribution centers streamline and error-proof business processes, improving employee productivity as well as customer service and satisfaction. Wi-Fi (802.11a/b/g), Gun Grip, 1D Laser Scanner, 48 key Alphanumeric Keypad, High Capacity Battery, Bluetooth, Full Audio, Color Touch Display, Windows Mobile 6.5 Classic, 256MB RAM/1GB ROM, English. Interface cables and charging cradle sold separately. For the full kit see (Part# MC3190-GL4H24E0A-KIT). Gun Grip, 1D Laser Scanner, 38 key Alpha Shift Keypad, High Capacity Battery, Interactive Sensor Technology, Wi-Fi/Bluetooth, Full Audio, Color Touch Display, Windows Mobile 6.5 Classic, 256MB RAM/1GB ROM, English. Cables and charging cradle not included. Gun-Grip, 1D Laser Scanner, 38 key Alpha Shift Keypad, High Capacity Battery, Wi-Fi/Bluetooth, Full Audio, Color Touch Display, Windows Mobile 6.5 Classic, 256MB RAM/1GB ROM, English. Cables and Charging Cradle Not Included. For the complete kit see (Part# MC3190-GL3H24E0A-KIT). Gun Grip, 1D Laser Scanner, High Capacity Battery, Interactive Sensor Technology, Wi-Fi/Bluetooth, Full Audio, Color Touch Display, Windows CE 6.0 Pro, 256MB RAM/1GB ROM, English. Cables and charging cradle not included. Wi-Fi (802.11a/b/g), 1D Laser Scanner, Windows CE 6.0 Pro, Gun-Grip, 256MB RAM/1GB ROM, 38 key Numeric Keypad, High Capacity Battery, Bluetooth, Full Audio, Color Touch Display, English. Interface cables and charging cradle sold separately. For the full kit see (Part# MC3190-GL3H04E0A-KIT). Gun Grip, 1D Laser Scanner, 28 key Numeric Keypad, High Capacity Battery, Interactive Sensor Technology, Wi-Fi/Bluetooth, Full Audio, Color Touch Display, Windows Mobile 6.5 Classic, 256MB RAM/1GB ROM, English. Cables and charging cradle not included. Gun Grip, 1D Laser Scanner, 28 key Numeric Keypad, High Capacity Battery, Wi-Fi/Bluetooth, Full Audio, Color Touch Display, Windows Mobile 6.5 Classic, 256MB RAM/1GB ROM, English. Cables and Charging Cradle Not Included. Gun Grip, 1D Laser Scanner, 28 key Numeric Keypad, High Capacity Battery, Interactive Sensor Technology, Wi-Fi/Bluetooth, Full Audio, Color Touch Display, Windows CE 6.0 Pro, 256MB RAM/1GB ROM, English. Cables and charging cradle not included.